It is difficult to speak about such an exhibition. Almost as difficult as speaking about the whole of Moscow. One has to see Moscow, walk along its streets. get soaked through with the city rain and get dried out under the ash-trees and poplars rustling along the boulevards. 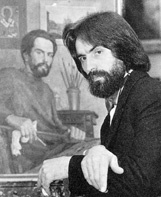 In the same way exactly as one should see the works by painter Victor Loukianov. To pick up a barely perceptible scent of the old Moscow corners, to recognise buildings, areas, blind alleys, “patches”, that one has seen so many times but has never actually noticed in the rush of everyday life. 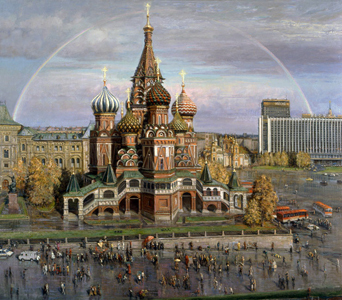 This painter can see the true Moscow – not the faceless houses of Khruschov’s times, not the Palace of Congresses-Soviets-Salutations, not the blatant costume jewellery of avenues. He can see and paint the Soul of the city. the freedom», is a gloomy «KISS» painted in Gothic. The Centre at Night – a couple of illuminated windows (could be street cleaning ladies on guard, or simply drunken guys sitting late…) are interfering with the untroubled sleepy tranquillity of a curved lane – and old man bent under the weight of centuries. 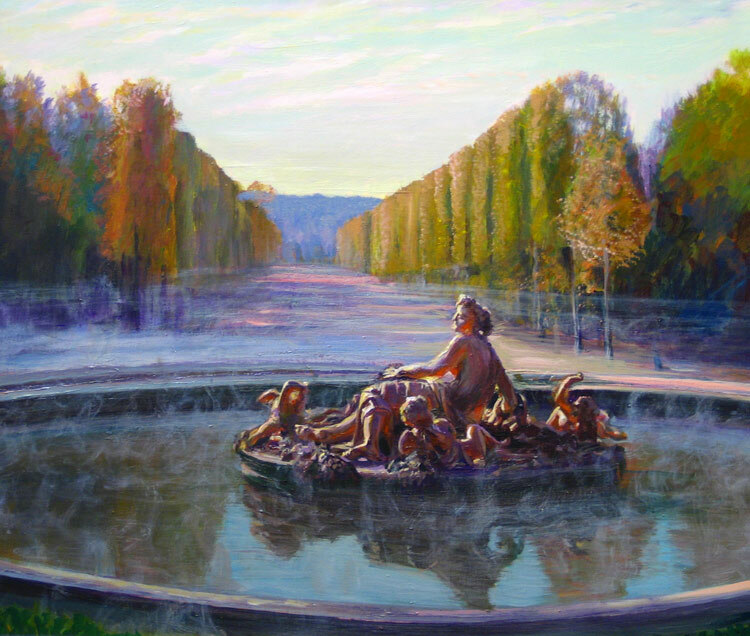 The Spring in the Alexander Garden – melted puddles under the Kremlin Wall, various people wanders around, warm air is swimming over, advancing, and there is no salvation to the snow-drifts and ice. 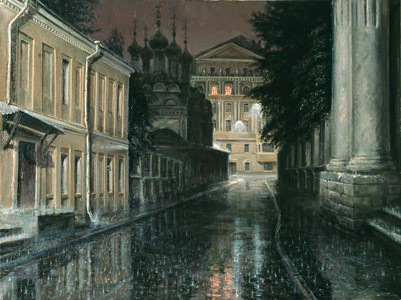 Rain in the Strastnoi Boulevard – couple in love are kissing-embracing, noticing neither the rein, nor the eternal witness of their life – the Mme Moscow. And here is one more couple in the park – they’ve given up talking, broke up, and She is already striding away, towards the streets, the houses, towards Moscow. Don’t be sad, the Intended husband! Moscow will reconcile you, Moscow will caress you, Moscow won’t let you get lost! In one of the halls there is a fairly monumental “Entry to Jerusalem”. It’s not by chance that this picture is here. Well, of course, it would have been blasphemy to talk of Christ and the Apostles as of honorary citizens of Moscow. But to Victor Loukianov, our city is, first of all, the Third Rome. 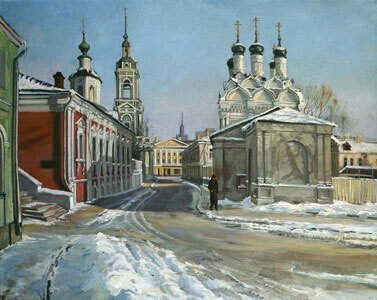 That is, probably, why works depicting the Moscow churches – even the neglected, abandoned, half-destroyed ones – are illuminating a particular kindness. That is why a modern city scenery «Cathedral of the Virgin Protectress» occupies the central space in one of the halls. I did not even realise at first, that a huge, solemnly shining Catherdal – is the well-known-since-birth «St Basil’s». Honestly speaking, not everybody has the gift of seeing SUCH a Cathedral of the Virgin Protectress, – rising above the daily vanity, above all the tourists, photographers, flags, a strange arc shining over it (the rainbow after the heavy rain? the Pokrov himself? – let one see on one’s own). It is difficult to speak of this exhibition. So just come to the Slavic Cultural Centre in Chernigovsky Pereoulok and look. 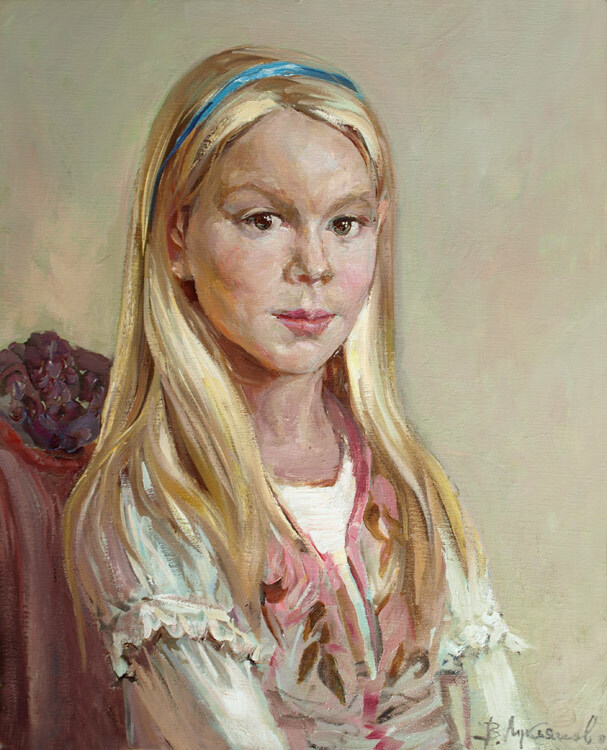 Especially since this 23rd exhibition of the artist is the first personal one in the capital. This is why the master tends to consider it his real, main creative debut. Apart of the Moscow landscapes, another favourite theme of the artist – Bulgaria – is generously represented. - What is your favourite place in our city? - Can you summarise Moscow in just one image – material or ideal? - Well, this is quite a daring venture…A dead man? No, not a dead man – the city is alive, it breathes, cathedrals are being restored… A sick man? A man sick with arrogance, megalomania, «the complex of the capital» – the capital of the Soviet Union, Subjects of Federation, etc. A label. An outer gloss. While in the times when Moscow was declared the Third Rome, there was nothing superficial – the greatness was genuine, not more and not less than necessary; and it never affected the hospitality…. Then they stuck grandiose sky-scrapers around. For so many centuries had Moscow avoided rocketing into the skies! 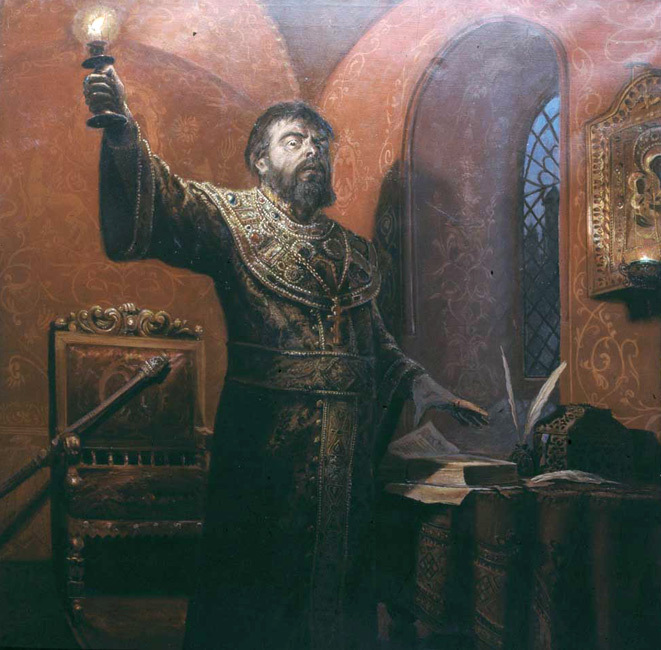 There was only one «scraper» – Ioann the Great Bell Tower – and even that one was erected by Boris Godunov to give jobs to people in a hungry year. And now we walk around the city – here and there are “he-goats” of glass and concrete. And not only do they stand in the place of the old buildings, but whole block around are destroyed. As if saying: Look how beautiful I am! In exactly the way young men in dark glasses and silver necklaces feel Masters of the streets. Ivan, who doesn’t remember his Mother, who does not care a straw about his Father’s Will – this is how I see the city now. Only when we cure the Soul, there will be normal houses, prosperity, peace and cosiness.